View More In Gratinee Bowls. The new Padron World Cuisine copper pieces are additions to an already extensive selection of miniature cookware that elevate the look of any setting. The collection includes sauce pans, rondes, saucepots and sauté pans that are made of a 3-ply combination of copper, aluminum and stainless steel, as well as 2-ply copper and stainless steel covers. The classic look is enhanced by stainless steel handles that are coated with a corrosion-free titanium alloy that boasts the look of polished brass, and secured by stainless steel rivets. Lids sold separately. Perfect for oven-to-table service, these pieces are an elegant form of presenting accompaniments or individual portions of dishes such as soups and stews, baked pastas, custards or soufflés. The 2.7mm (10-gauge) thickness of the walls, and optional covers, allow for added heat retention and will ensure that contents stay warm. Note that all dimensions are interior and do not include handles or the thickness of the material. Use caution when using on cooktops, as handles get hot during the cooking process. 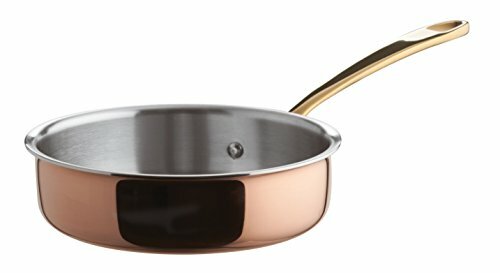 To extend the life of copper cookware, always wash by hand and dry immediately. Not induction compatible. Lids sold separately. Tri-ply body is made of copper/aluminum/stainless steel. Stainless steel handles are coated with a corrosion-free titanium alloy that boasts the look of polished brass, and secured by stainless steel rivets. Outer diameter is 4 1/2in, capacity is 12ozs. Can be used on cooktops, and oven-safe; not induction-ready. If you have any questions about this product by Paderno World Cuisine, contact us by completing and submitting the form below. If you are looking for a specif part number, please include it with your message.